June is National Cataract Awareness Month, so it’s the ideal time to learn more about this condition, which is a leading cause of vision impairment in the United States. Cataracts are a clouding of the eye’s lens that affects vision, causing blurred vision, glare sensitivity, faded color perception and reduced night vision. The condition may make it seem like you’re looking through a cloudy piece of glass. 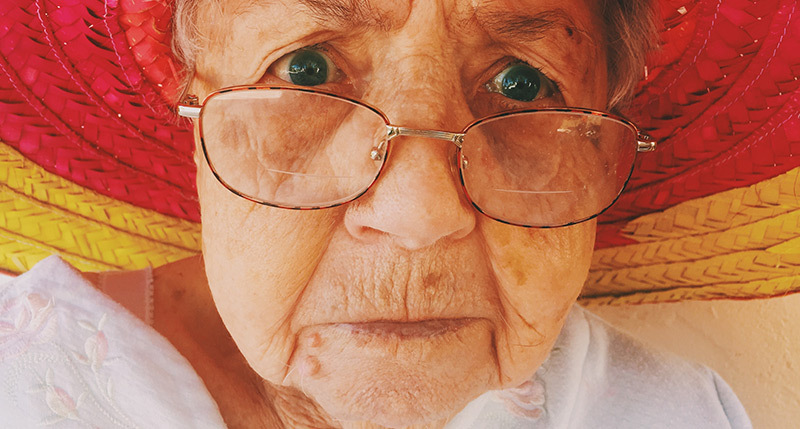 Cataracts, a common age-related eye disorder, impact more than half of Americans by age 80. Fortunately, the vision deterioration caused by cataracts can be surgically corrected. Patient: I started noticing that I couldn’t see very well, especially at night. I updated my glasses prescription, but I just couldn’t see as well as I used to―it got to be very annoying. My optometrist told me that I had cataracts, and if they continued to grow and impede my vision, I would probably know when it was time to schedule surgery. Optometrist: We see a lot of patients who have cataracts. I usually first detect them before the patient notices any problems by viewing the eye through a slit lamp, an optometric microscope we use during all patient exams. I can see cataracts when they’re quite small; they develop at different rates in different people. They can affect one or both eyes. Some grow quite quickly, while others take years before they impact a patient’s vision. We track the cataract’s growth over the course of several visits, and when it gets to a point where it’s impacting the patient’s lifestyle, I recommend cataract surgery. Patient: That’s exactly how it happened with me. I was aware I had cataracts for several years before they got bad enough to take action. But I definitely knew when it was time. I couldn’t see very well in dim light, and everything just looked clouded, like my glasses were smeared, but whenever I checked, they were clean. I was misreading words― for example, I would think “car” looked like “cat,” and then realize from context that I had gotten it wrong. When driving, by the time I got close enough to read a street sign, it was too late to turn. Night driving was the worst because each oncoming car looked like it had four headlights. It was hard to concentrate and see the road at night, especially if it was raining. Optometrist: Those are very typical complaints from someone experiencing the effects of cataracts. The most common complaint I hear is, “I’m just not seeing as well as I used to see.” Glare is a big problem, as is decreased vision. In addition, a patient’s color perception is usually not accurate. Patient: As far as colors go, I thought I was seeing colors well, but sometimes I wear a pair of maroon shoes and my daughter says they are red. I just thought she had different color perception than I do. I’ll be anxious to see if colors look brighter to me after surgery. Because if that’s the case, I’ve probably been wearing some REALLY bright colors. I feel like I’m seeing colors well, but maybe I’m not. I’ve got some pants that I think are maroon and when I wore them, somebody complimented my purple pants, which I thought was odd. As far as seeing motion and peripherally, none of it is very clear anymore, but I can still see. Optometrist: When patients are ready to have their cataracts repaired, we recommend a surgeon, and they’ll schedule a pre-surgical appointment. Patient: My surgeon mailed the forms I needed to fill out in advance, so I didn’t have to do that on the day of the office visit. They needed to know my medications and medical history. At the pre-surgical appointment, I watched a 5-minute video about people who had cataract surgery and could see fairly clearly the very next day when they took the bandage off. They also showed me a diagram of making a slit in the eyeball, breaking up and removing the old lens, and then inserting a new, folded lens into the eye that unfolds when it gets into place. The surgeon’s staff dilated my pupils, tested my vision and took digital pictures of each eye. Optometrist: For cataract surgery, patients have a choice of lens implants: either multifocal lenses or standard lenses. Multifocals enable a patient to see both up-close and at a distance but are often more expensive. With standard lenses, the patient can see at a distance but would likely need glasses for reading and up-close work. Patient: I don’t mind wearing glasses, so I opted for the standard implant. Optometrist: Cataract surgery involves one eye at a time, typically scheduled about two weeks apart. They rarely operate on both eyes at the same time, because the surgeon wants to make sure the first one is successful since everybody heals differently. It’s a preventive measure because on the slight chance there is a problem, if you did both eyes at the same time, you’d have a problem with both eyes, which wouldn’t be good. Patient: Before my cataract surgery, I visited my general practitioner for a pre-operative physical to ensure I was healthy enough to undergo the procedure. Optometrist: Patients also get a prescription eye drop that is critical in preparing the eye for surgery. It’s an antibiotic, to make sure the eye is as healthy as can be, which helps prevent complications. Patient: I started putting eye drops in my right eye a few days before the surgery. And the night before my surgery, I couldn’t eat after midnight, but that wasn’t too surprising. Be sure to read Part 2 of this blog post, where the patient discusses the day of surgery and her outcome.